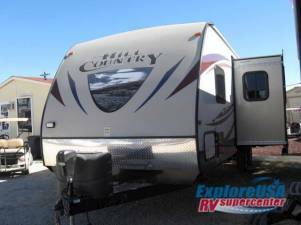 Double Slide Hill Country Travel Trailer, Rear Bunks, Shower, Lav., Toilet, Super Booth Dinette/Sofa Slide, Kitchen Island w/Dbl. Kitchen Sink, Ward./Pantry, Refrigerator/3-Burner Range/Microwave Slide, E-Center, Queen Bed, Dbl. Wardrobes, Overhead Cabinets Throughout, Pass Thru Storage, Ext. Kitchen w/2-Burners, Single Galley Sink, Refrigerator & Much More. Available Options May Include: Outside Grill.